Observing the career of M. Night Shyamalan over the 20 years since The Sixth Sense made him a cinematic superstar has been a deeply baffling experience. First, he seemed to find himself locked into his identity as “the surprise plot twist guy,” even as it became clear he was more gifted behind a camera than he was in front of a keyboard. Then he dabbled in director-for-hire work like The Last Airbender and After Earth, where the results were … not great. When he re-emerged with the back-to-back low-budget hits The Visit and Split, it felt like he had re-discovered the small scale sense of menace where he was most successful. So of course, what more logical way to continue than … to make a sequel connecting Split to a larger cinematic universe. Hmmm. And thus we find ourselves with Glass, following through on the tease at the end of Split that the monstrous serial killer known as The Horde (James McAvoy) occupied the same world as David Dunn (Bruce Willis), the unbreakable vigilante hero from 2000’s Unbreakable. There are some promising moments as Shyamalan begins to explore that world, with The Horde still on the loose and kidnapping young girls, and Dunn on the hunt for him, with his now-adult son Joseph (Spencer Treat Clark, also returning to the same role from Unbreakable) serving as his sidekick. The director’s visual style has always been most compelling in his use of off-screen space, and he delivers a few solid sequences based on the mystery of the thing that might be lurking in the darkened corners. The first battle between Dunn and The Horde, however, eventually leads to their capture and incarceration in a mental hospital, where the villainous mastermind Mr. Glass (Samuel L. Jackson) is also a patient—and it’s here where Glass quickly becomes a mess. While the hospital setting allows for some effectively stark image-making, the story grinds to a halt for a whole lot of talking, mostly from the therapist (Sarah Paulson) trying to convince all three men that they’re suffering from super-power delusions of grandeur. The tone also goes off the rails, spinning between Dunn’s grim, taciturn sense of purpose and McAvoy reveling in playing The Horde’s various incarnations, while also taking tangents to follow both Joseph and Casey (Anya Taylor-Joy), who survived and escaped The Horde in Split. It’s a movie made of pieces, and the attempt to paste those pieces together just doesn’t work. More confounding still are Shyamalan’s attempts to take Unbreakable’s philosophizing about comic-book mythology and give it an even weightier sense of consequence. Plenty of other stories have deconstructed and reconstructed the societal role of the super-hero and the super-villain as comic-book movies became omnipresent in the 21st century, so the ideas feel far less fresh than they did 19 years ago in Unbreakable. But as the story’s secrets unfold—yes, it’s a Shyamalan movie, so there will be some—Shyamalan’s notions about the way the world would respond to super-powered people seem to point our sympathies in the wrong direction. Or, at the very least, he seems wildly, irrationally optimistic about what might be considered a happy ending. 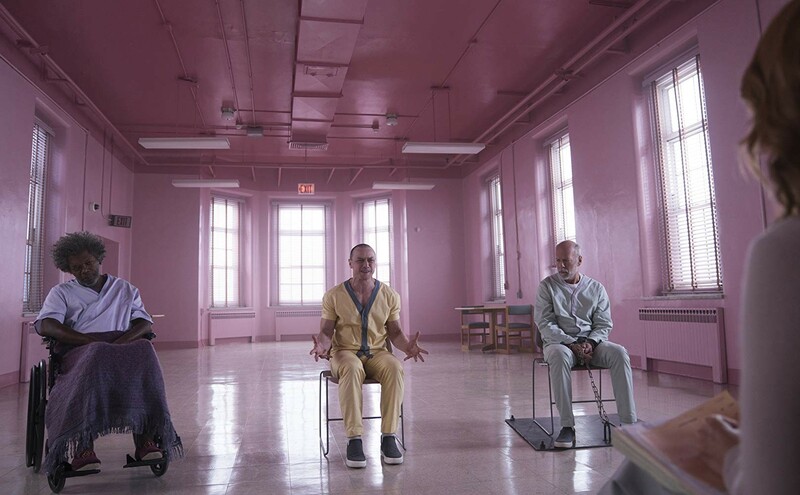 In the few moments where Glass leans into its identity as a de facto comic-book movie, there are at least some visceral pleasures, mostly because they allow McAvoy to play as big as possible. But Shyamalan doesn’t know how to make a super-hero movie that’s also a thinky meditation on super-hero movies that’s also a monster movie. After 20 years, he still seems to be trying to figure out what he’s good at.